Magnetic strips are highly flexible products suitable for labelling on storage racks, for lean projects and dividing of work tasks on whiteboards, signs etc. The flexible magnetic strips are part of the Larko Flex series and is produced in a high quality ensuring efficient and professional holding abilities. Apply on almost all types of metal surfaces such as whiteboards, regular boards, steel racks etc. 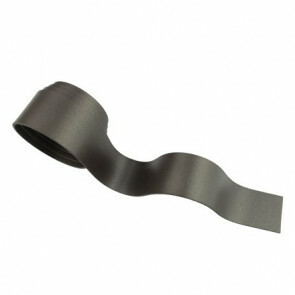 The flexible magnetic strips are characterized by their low magnetic strength, which facilitates easy moving and adjusting of the strips according to the needs. They never leave any marks or scratches in the surface after use. 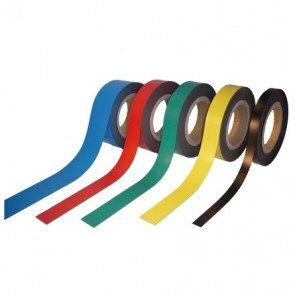 The magnetic strips are easily shortened using a utility knife or scissor and dymo labels can be placed in seconds. It is also possible to write directly on the flexible magnetic strips using a non permanent whiteboard marker. The text can then be removed and the magnetic strip reused. The products are available with plain, white or coloured surface. 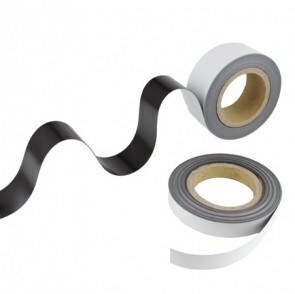 If in need of strips with adhesive, please see the magnet tapes.